We need between three and five volunteers to take notes directly onto the wiki during the event. It's very important we record the success of the event. Aside from taking notes, you will be responsible for collecting slides and other materials to post on the wiki. Volunteers will receive a free Open Everything NYC T-shirt! Contact me to volunteer. Please arrive on time, the doors open for registration at 8:00AM and the first session will start promptly at 9:00AM. The event will come to a close at 6:00PM. A designated food/drinking establishment will be announced - we're currently seeking group deals in the vicinity of UNICEF HQ. contact me with suggestions. Free lunch will be provided for all registered attendees. A vegetarian option will be available. We still haven't found sponsorship to provide free T-shirts. A limited quantity of shirts will be available for sale for $10 (cash only) at the event. Volunteers will receive a free T-shirt. If you or your company would like to sponsor free T-shirts please contact me. 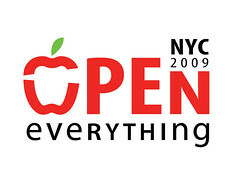 Open Everything NYC is just nine short days away, please help get the word out by blogging, tweeting, denting, facebooking, emailing, sending to lists, calling, and talking about the event. We're depending on you to reach the best people in New York, we know you'll do fine. Make sure to note that registration is required at (http://nyc.openeverything.us). If you have ideas or suggestions, please send them my way.